Preparation for an expedition like this is a serious matter. From the delineating scientific questions, to preparing research protocols, selecting and approaching potential donors, setting up the logistics to cater for 84 people of 7 different nationalities over a period of two months (including 63 researchers, technicians and local assistants). In total, two years of preparation were required to organise this adventure. Those taking part in the land-based expedition will work in eight stations at altitudes of between 200m and 3,700m, each located 500m higher than the last. The parcels of land where work will take place have been carefully selected and prepared several months in advance by members of the Binatang Research Center. At each altitude, 20m2 parcels of land have been marked out. Inside each parcel, every tree with a diameter greater than 5cm has been identified and labelled from a botanical point of view. On each parcel of land, researchers will lay the same number of a series of similar traps; these will ensure standardised collection protocols at each altitude level. Une phyllie (un phasme-feuille) dans les forêts du Mont Wilhelm, à 700 m d’altitude [© Maurice Leponce, MNHN / PNI / IRD]. Although certain specialists on birds, reptiles frogs and small mammals will take part in the expedition, the main purpose will be to collect biodiversity data on “neglected” species; invertebrates, which represent 80% of currently described species, but which are little known, despite their importance to the functioning of ecosystems. The main objective is to paint a portrait of these “little creatures who run the world” as biologist Edward Wilson described them. Sustainable sampling at altitude will take place between the 10th October and the 11th November, then comparative studies will be carried out in the lowland forest in the vicinity of Wanang. Finally, in the first quarter of 2013, small teams will return to the field to complete the experiments. This work will bring together both taxonomical and ecologist approaches. The objective being not only to account for the species present, but also to understand their interactions; who eats who and where? After being collected in the mountain camps, specimens will be brought back to a research station in Wanang where they will be pre-sorted before they are sent to the specialists working on the project in different institutions around the world. They will also be sent to The Papua New Guinea Forest Research Institute and the National Agricultural Research Institute of Papua New Guinea. At this point, once the expeditions have returned, the hard work of analysis and research will begin, and will go on for months or years. For logistical purposes, each camp will have its own cook, two assistants (villagers from local communities) and a parataxonomist. Parataxonomists (and paraecologists) are to the natural sciences what paramedics are to medicine. Without strictly speaking being taxonomists or ecologists, they are trained by researchers in systematics and in the art of sampling and sorting. Parataxonomists are capable of collecting specimens in the wild, preparing them, photographing them, identifying to which family they belong, and processing the data collected so that it can be analysed by scientists at a later date. They are also able to carry out experiments in the field. Because they are members of local Papuan communities, parataxonomists can provide essential knowledge about the local environment to the expedition. In particular they have participated in preparing the parcels of land over the months preceding the expedition’s departure. The involvement of parataxonomists in scientific work has been successfully trialled by the Binatang Research Centre for a number of years. 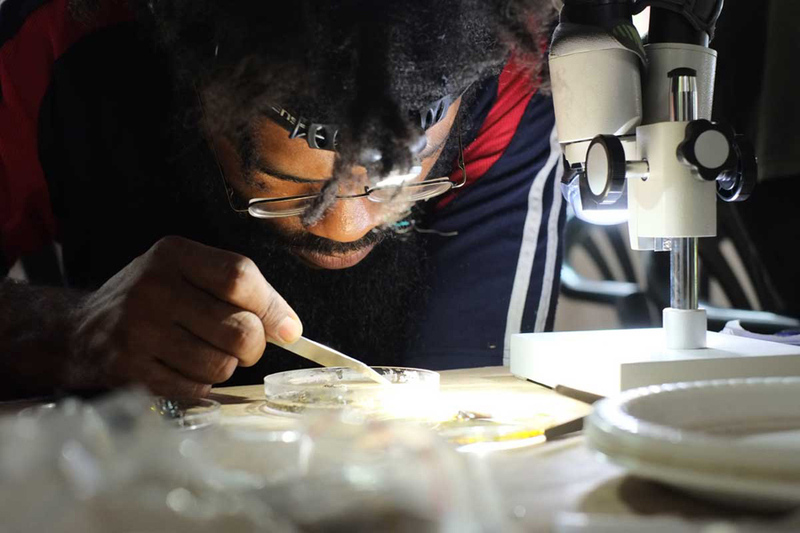 This non-profit making NGO acts both as a research centre dedicated to studying the ecology of insects in tropical rainforests, and a training centre and educational institution, which aims to build awareness of environmental issues among Papaya New Guineans. The BRC was founded in 1997 in Madang Province, the organisation brings together young people from communities living in forests and rural areas with students and researchers from Papua New Guinea and abroad. In recent years, work carried out by the centre has been the subject of several major publications that have appeared in prestigious scientific journals such as Nature or Science. 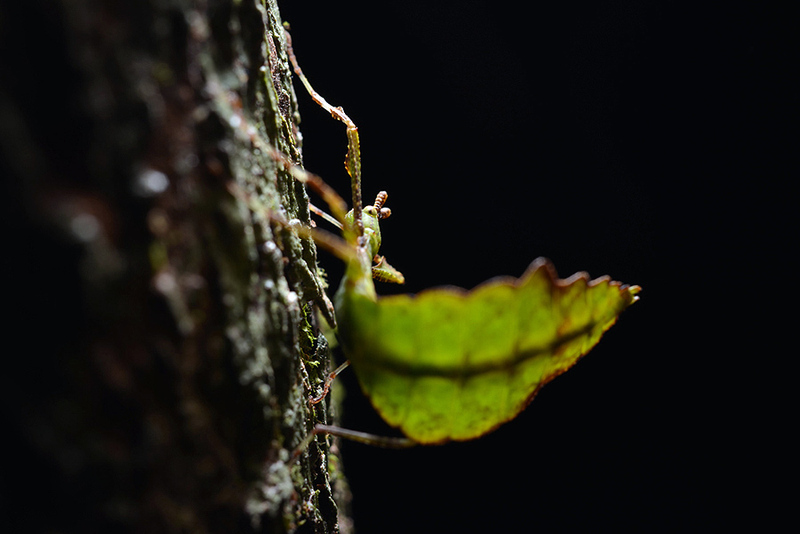 Bradley Gewa, un des parataxonomistes du BRC, fait un premier tri des insectes collectés dans les forêts du Mont Wilhelm [© Olivier Pascal, MNHN / PNI / IRD]. Potential participants in the land-based expedition were selected not only for their scientific knowledge, but also based on their physical condition. The land-based part of the expedition will take place in an isolated, tropical area, which can only be reached by long journeys over high altitude rough terrain. Added to this are the weather conditions, which can sometimes be difficult (hot or cold, depending upon altitude and humidity, etc) along with very basic living conditions. Health and safety are therefore crucial to the expedition. Before leaving, those taking part are required to undergo a comprehensive medical examination. Medical evacuation involves transporting a person by helicopter to a facility with resuscitation equipment; this operation is weather dependent and can take several hours. It is therefore far better to check for possible joint and cardio-vascular problems before leaving! Nevertheless, the difficulties encountered should be no more challenging than those met on a mountain trek, with likely risks no more serious than blisters, stains and sprains, although added to these will be the discomfort of insect bites and leeches, however those stationed in camps at high altitudes will be spared the risk of malaria, as the mosquitoes which carry the disease do not live above 1,200 – 1,500 metres. Finally, the equipment used will be relatively light, because the camps will be spread over a relatively large area and all equipment will have to be carried.